Happy Valentine's Day! Because I love you, here are some statistics. Following a suggestion by Eric Winsberg, I decided to look at the IPEDS database from the National Center for Education Statistics to see how commonly Philosophy is chosen as a second major, compared to as a first major, among Bachelor's degree recipients in the United States. I examined data from all U.S. institutions in the database, over the three most recent available academic years (2013-2014, 2014-2015, and 2015-2016), sorting completed majors by the IPEDS top-level major categories (2010 CIP two-digit classification), except replacing 38 "Philosophy and Religious Studies" with 38.01 "Philosophy". Separately I downloaded the grand totals of completed first and second majors across the U.S. In all, across all institutions, 5,680,665 students completed a first major. Of these, 289,639 (4.9%) also completed a second major. 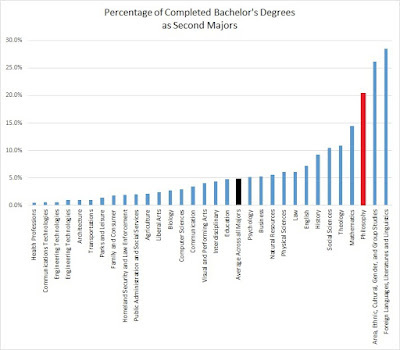 Not many students earn second majors! However, the ratios vary greatly by discipline. In all, 24,542 students earned a Philosophy major, of which 5,015 (20.4%) earned it as a second major. At a minimum, then, 20% of Philosophy majors are double majors. If half of those double majors choose to list Philosophy as their first major, then 40% of Philosophy majors in the U.S. are double majors. Unfortunately, the NCES database doesn't allow us to see how many of the people with first majors in Philosophy also had second majors in something else. Forty percent might be too high an estimate, if double majors who have Philosophy as one of their majors disproportionately list Philosophy as their second major. But even if 30%, rather than 40%, of Philosophy majors carry Philosophy along with some other major, that is still a substantial proportion. Here's another way of looking at the data: 0.3% of students choose Philosophy as a first major, while among those who decide to take a second major, 1.7% choose Philosophy. Across all 37 top-level categories of major (excluding from analysis the top-level category Philosophy & Religious Studies), only two had a higher percentage of students completing the major as a second major: Foreign Languages, Literatures, and Linguistics (28.5%), and Area, Ethnic, Cultural, Gender and Group Studies (26.2%). Let's call this the Second Major Percentage. In this respect, Philosophy is quite different from two of the other big humanities majors with which Philosophy is often compared: English Language and Literature (7.2%) and History (9.3%). Interestingly, Mathematics, which is often regarded as a very different type of major, ranks fourth, with a Second Major Percentage of 14.4%. Last fall, I presented data showing the precipitous decline in Philosophy majors in the past few years -- from 0.58% of all graduates to 0.39% of all graduates. One hypothesis, which I thought worth considering, is that Philosophy tends disproportionately to rely on double majors, and it is increasingly difficult for students to earn a second major. However, I now think that a decline in second majors can't be the primary explanation for the decline of the Philosophy major. First, although the percentage of students earning a second major has declined somewhat in the period -- from 5.4% in 2009-2010 to 5.1% in 2015-2016 -- that is small compared to the magnitude of the decline in Philosophy, where completions are down by 19% in absolute numbers and about a third in relative percentages. Second, we saw similar declines in English and History, and those disciplines don't appear to be as reliant on students' declaring a second major. That said, Philosophy does appear to rely heavily on double majors, so we might expect policies that reduce the likelihood of double majoring to disproportionately harm Philosophy programs. Such policies might include increasing the requirements for other popular majors, increasing general education requirements (apart from G.E. requirements in Philosophy, of course), and increasing pressure to complete the degree quickly. To further explore the question, I divided the colleges and universities into two categories: those with a high rate of double majoring (>= 10% of graduating students have two majors) vs those with a low-to-medium rate of double majoring (< 10%), excluding institutions with < 300 Bachelor's degree recipients over the three-year period. As expected, at institutions where students commonly complete second majors, about three times as high a percentage of students completed Philosophy degrees than at institutions where students less commonly complete second majors: 9240/935419 (1.0%) vs. 14876/4656563 (0.3%; p << .001). Direction of causation is of course hard to know. These groups of institutions will differ in many other respects too, and that is very likely to be part of the causal story, maybe most of the causal story. 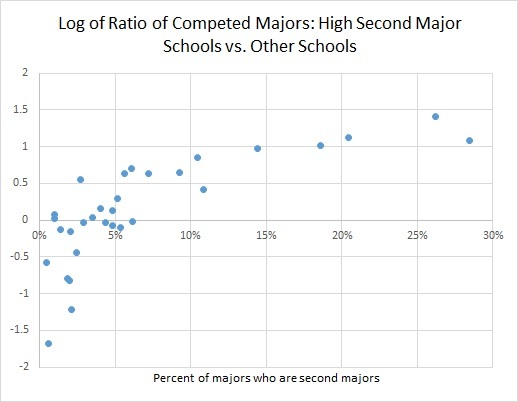 And yet, the following fact is suggestive: The four majors that differ most in percentage between the two groups of universities, as measured by the ratio of percentage of students completing the major at the high-double-major schools to the percentage completing the major at the low-double major schools, those are exactly the same four majors that have the highest rate of second majors in the overall dataset. Area, Ethnic, Cultural, Gender and Group Studies: 1.5% of majors at high-double-major schools vs. 0.4% at low-double-major schools, ratio 4.1. I need a good name for this ratio, but I can't think of one, so let's just call it The Ratio. Of course, the median Ratio is about 1.0. History and English both have Ratios of 1.9, which is substantially above 1.0, but not as high as these other four. 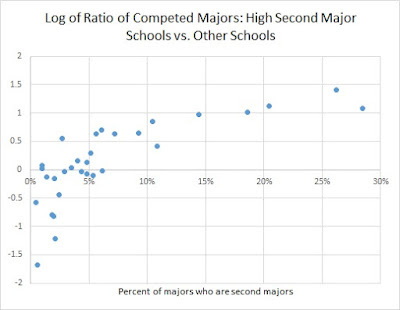 In other words, perhaps unsurprisingly, the four majors that students are disproportionately most likely to declare as second majors are exactly the same four majors that show the greatest difference in completions between schools where lots of students have double majors and schools where few do. So although it seems unlikely that the recent sharp decline in Philosophy majors is due primarily to a decline in the overall proportion of students declaring two majors, it remains plausible that conditions that are good for double-majoring in general may be good for the Philosophy major in particular. Women Have Been Earning 30-34% of Philosophy BAs in the U.S. Since Approximately Forever* (Dec 8, 2017).